It's been a torrid time for UKIP since the referendum in June. And not in a good way. 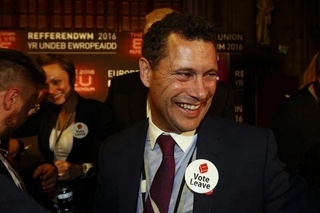 On no less than three occasions, the cause of the purple party's discomforts have, ostensibly, centered upon the person of Steven Woolfe. There was the farce of the leadership campaign where, readers will recall, Woolfe demonstrated his lightning fast organising skills by submitting his candidate's application some 17 minutes late. Compounding this most rookie of errors were revelations he'd let his membership lapse. Oh, and that he'd forgotten to declare an ancient drink driving conviction while standing for the 2012 Police and Crime Commissioner elections in Greater Manchester, leaving him open to charges of electoral fraud. Then, at the start of the month, we were entertained by the fracas between Woolfe and the aptly named Mike Hookem MEP. And now, there's this. In quitting UKIP "with immediate effect", Woolfe is unsparing with his criticisms. There are "huge negative camps" threatening the party with "a death spiral", and members saying "horrific" things to each other. Standard for UKIP, I'd have thought. He also concludes that the party has next to no future without Nigel Farage as he's the only figure capable of keeping a lid on things. True, but even then, UKIP was plagued with infighting, splits, briefing and counter briefings, and a disproportionate number of its wastrel MEPs hauled before the courts. And there's also the suggestion the party's on the hook for 800 grand, minus a willing sugar daddy to make the shortfall good. This latest round in UKIP's decline is something first forecast on this blog after the 2015 general election. Feeding off the historic anti-Labour sections of the working class, the lumpens, the petit bourgeoisie, and retirees, UKIP's core, if it can be called that, was always highly volatile. A coalition built around europhobia and anti-immigrant bigotry can glue such a bloc together for a time. The adhesive can be strengthened by the application of a charismatic man-of-the-people type, and for a while, it worked. While it was on the up, it appeared as if these divisions didn't matter. UKIP have shrugged off dodgy MEPs and egos as it climbed the polls, won the European elections, nicked two MPs off the Tories, netted councillors, and made the political weather. But after the general election, and post the EU referendum, the party's tendency to historic decline has accelerated. With Theresa May cornering the let's-be-beastly-to-foreigners market, UKIP is not about to repeat the glories. With or without Farage. Which is why, ultimately, Woolfe has thrown the towel in. He deserves some credit for speaking candidly to the BBC about his injuries, but one thing he isn't is stupid. Apart from his politics, Woolfe does seem personable and usually acquits himself well on the television. Yet he hasn't got what it takes to lead UKIP's gaggle of silly, stupid, racist geese. In his presentation and personality there is nothing setting him apart from any other smooth, media trained mainstream politician. Qualities that might endear him to a nice Conservative Association somewhere, sometime, but definitely not what a so-called people's army demands. They need a Farage or, ugh, a Kilroy. The departure of Woolfe epitomises the crisis, the cracking up of UKIP. The party is dying because it cannot replace itself. there just aren't sufficient numbers of younger activists and, crucially, voters willing to give the party time of day. Small wonder it can manage a succession properly. Looking among the personages and non-personalities of the party's leading cadre, there is not one among them capable of filling Farage's shoes. And in the politics after the referendum, it lacks purpose beyond an occasional council by-election annoyance. Woolfe's departure might be enough to save his career from the knackers yard of politics. It looks increasingly like the same can't be said for his erstwhile party. Steven Woolfe's departure from the rapidly collapsing Nigel Farage Fan Club comes as no surprise. He always did cut a rather incongruous figure in it. Despite the fact that Farage, and UKIP itself as such, were not allowed in the official Leave campaign at all, they nevertheless believe that they were responsible for the result. They are adamant, indeed, that the referendum itself was only held because UKIP had dropped from all of two seats to all of one. They are like the dotty devotees of an obscure pop singer of yesteryear who insist that he was the most influential artist in the history of the genre. Even the claim to have reframed the debate on immigration does not stack up. Most people who support immigration controls, as to some extent almost everyone does, do so by reference to the pressure on jobs, services and infrastructure. Even then, they almost never quite mean the immigrants, or the descendants of relatively recent immigration, whom they themselves happen to know. And most people do know immigrants, and the descendants of relatively recent immigration. Leaving only the people who just don't like people, who don't get out much, who wouldn't even want to. The people, bluntly, who don't have any friends, or any real hope of acquiring any. Such are those who devote their lives to the idea that an obscure pop singer of yesteryear was the most influential artist in the history of the genre. And such are those who join UKIP. Certainly, such are those who are going to remain in it even now. Back to the Conservatives for Woolfe, then. To a Leader who has not invoked Article 50, and whose only legislative proposal on the subject is make all EU law that of the United Kingdom even after we had left. There, he can give every possible support to such soundly Breitbartish policies as the abandonment of the Budget surplus target, and the abandonment of the Work Capability Assessment. As workers' reps on boards, and restrictions on pay differences within companies. As a crackdown on tax avoidance, and a ban on tax-avoiding companies from public contracts. As a Department for Industrial Strategy, and a huge programme of infrastructure spending in general and of housebuilding in particular, As a cap on energy prices, a ban on foreign takeovers, and an inquiry into Orgreave. Like at least half of UKIP, Woolfe just wants to be a pukka Tory again, and he doesn't care what he has to say or do in order to achieve that. Likewise, Emma Nicholson, who left the Conservative Party because it was insufficiently pro-EU for her even under John Major, has gone back ostensibly because the Lib Dems are now too pro-EU for her. And because of a grammar schools policy that she must know will come to nothing. That has most emphatically never been the policy of the Lib Dems, either. The Tory family is determined to reunite, in the way that the Labour family is determined to reunite. There will always be the Far Right irreconcilable to the Conservative Party, in the way that there will always be the ultra-Left irreconcilable to the Labour Party. But that is all. Why, if it were not for the Durham Teaching Assistants and their need to deprive 57 Labour councillors of their seats next year, then I myself might have made some effort to go back by now. Except for those who actively wish to participate in my council and parliamentary campaigns, and do please get in touch if that is you, then I would and do strongly encourage people to join the Labour Party, and to involve themselves in it in every possible way.